An application to have an electronic tag removed so that a 40-year-old man could go swimming was refused last Thursday at Banbridge Magistrates Court. Robert Foster, Hillhead Gardens, Banbridge, is on bail on charges of damaging a car by fire and unlawful possession of Mephedrone on September 24, 2014. Part of his bail conditions is that he is tagged. A police officer told last week’s court that the investigating officer in the case felt the tag was proving effective in monitoring the defendant’s behaviour. Mr Gabriel Ingram, representing the defendant, said Foster suffered from chronic back pain and was told by his doctor to try swimming. He added that his client had given up because of the embarrassment of having the tag and his pain has come back again. Mr Ingram said Foster had spent some time in custody on remand and received High Court bail in July of last year. He added that it had taken too long for the case to get to this point although it was accepted they are serious charges. Mr Ingram suggested that the police could carry out spot checks on Foster and if he breached his conditions in any way he could be brought back to court. 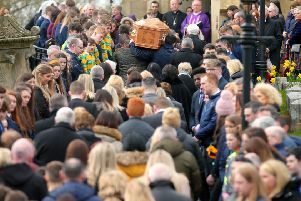 Deputy District Judge, Mr Liam McStay, said the length of time the case was taking was considerable but he had to weigh this against the seriousness of the matter. He added that the application was made on the basis the defendant wanted to resume swimming but there was no evidence in front of him from a doctor. Refusing to vary bail he adjourned the case until March 3 when a date will be fixed for a preliminary enquiry.